Stay connected with family while in this classic kitchen. 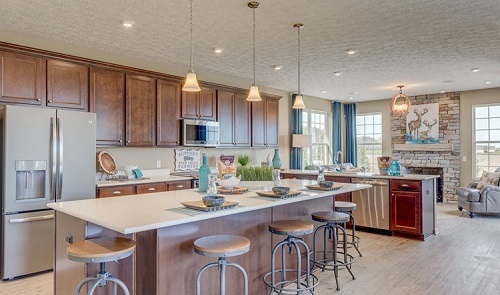 The Olvera II by K. Hovnanian Build On Your Lot in Sunbury, OH. This kitchen simply says classic. By using a variety of light sources and a warm color scheme, this space also has a cozy feel. The Slate refrigerator, beige accents and cream-colored floors contrast nicely with the brown cabinets, giving this kitchen more visual depth. Pops of blue from glass vases and curtains brighten the open-concept space, while simple patterns in the fireplace surround and fabrics add texture.